M-LINK is a new radio transmission system from MULTIPLEX. It operates on the 2.4 GHz ISM band, and is based on modern Frequency Hopping Spread Spectrum technology. The need for the user to change the RF channel (plug-in crystals, Synthesizer) manually is eliminated. 2.4 GHz Spread Spectrum systems divide up the frequency spectrum automatically, and for this reason conventional frequency monitoring control is no longer needed. Interference due to “channel clashes” (as is possible on the 35, 40 … MHz bands) is virtually eliminated. When the system is first used, all you have to do is “bind” the transmitter and receiver using a simple binding procedure. Once this is done, the receiver only recognises and processes the signals broadcast by its own transmitter. The 2.4 GHz ISM band provides the means of transmitting data from the model back to the transmitter. The receiver in an M-LINK system transmits the voltage of the receiver power supply to the transmitter in real time. If the voltage falls to a dangerous level, the transmitter generates a warning signal to alert the user. Additional external sensors (e.g. voltage, current, temperature) can also be connected to M-LINK receivers designed for this facility. MULTIPLEX M-LINK DR (Dual Receiver) receivers are of very sophisticated construction, and feature two complete receiving circuits in one case (receiver diversity). Both circuits receive constantly, and the circuit compares the signal quality; at any one time the better signal is selected for further processing, and is passed on to the servo outputs with zero delay. If reception conditions are critical, and / or the model is particularly valuable, two receivers can be coupled together in the model; this minimises signal reflections and polarisation effects which are typical of 2.4 GHz, and represents the highest possible level of security. The transmitter and receiver jump (hop) from channel to channel at the same rhythm, at intervals of just a few milli-seconds. The control data is actually transmitted during a fraction of this time. It is this brief period of occupation of each channel which minimises signal conflicts and suppresses interference. Even if individual data packets are lost on individual channels, the constant high-speed process of hopping from channel to channel renders the interruption invisible to the pilot. of safety, even for large-scale models. The enormous bandwidth available on 2.4 GHz makes it possible to transmit much greater quantities of data than is possible, for example, on the 35 MHz band (bandwidth 2.4 GHz = 83.5 MHz; 35 MHz = 1 MHz). Digital modulation in conjunction with sophisticated error-checking and correction in the receiver ensure excellent data quality. If the receiver detects data which has suffered interference and is irreparable, it passes on the last valid data to the servos, thereby bridging the period of the signal loss (HOLD mode). If interference continues beyond the (variable) HOLD period, FAIL-SAFE is activated, i.e. the receiver moves the servos to a programmable safety position (e.g. throttle off, control surfaces neutral). The FS positions are stored using a push-button at the receiver; some transmitters include a menu for this, enabling the Fail-Safe positions to be set “by radio”. 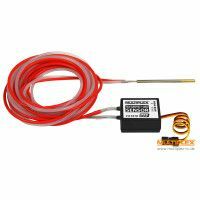 The typically short 2.4 GHz transmitter aerials are more robust and easier to handle than conventional telescopic aerials, and they also do not interfere with the pilot’s field of view. Short receiver aerials are much easier to install in the model. Small, modern, highly integrated transceiver ICs replace ceramic components, coils and filters, all of which are susceptible to damage from vibration. All MULTIPLEX M-LINK receivers feature a wide operating voltage range of 3.5 - 9.0 V, and are therefore largely immune to collapses in the power supply voltage. They are prepared for use with 2S LiXX batteries without voltage stabilisation to (typically) 6.0 V.
Apparatus operating on the 2.4 GHz band can be used world-wide. 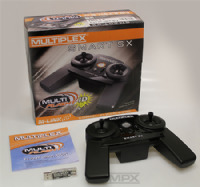 The components of the MULTIPLEX M-LINK system fulfill all current directives and statutory requirements.